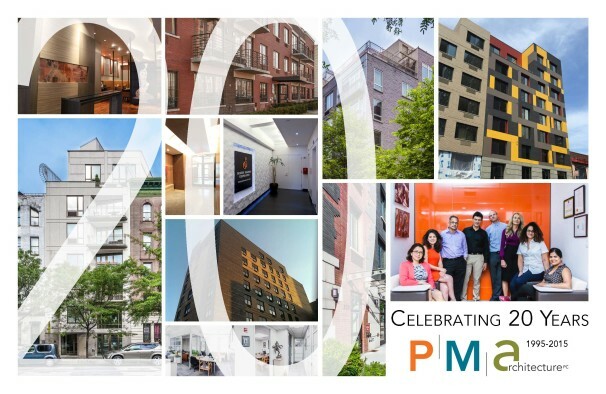 PM Architecture recently celebrated 20 years since the incorporation of the firm. Part of the celebration including unveiling a new logo, website and social media pages to give the firm a new look while still espousing the fundamentals that has kept PMA successful for the last twenty years. Over the last twenty years, PMA has successfully completed over 400 million dollars worth of work. And although we’re known for our multifamily rehabilitation work, our portfolio encompasses a wide variety of work including multifamily, mixed-use & mixed-income new construction projects, interior fit outs for commercial offices and showrooms, and interior design services for restaurants and private residences. Please visit the Projects page on our website to see samples of our work. In addition to changing our look, PMA has a strong and exciting multidisciplinary team of designers, project managers, project architects and planners. You can meet our staff and learn a bit about them on the Team page of our website. Finally, we are joining the world of social media! You can find us Facebook, Instagram at pmarchitecture, and on LinkedIn. Follow us to keep up to date with what we’re doing and what we find interesting! Here’s to another successful and fulfilling 20 years!